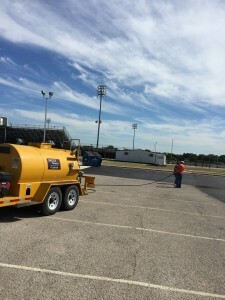 Protecting your asphalt investment from deterioration with a quality asphalt sealant is the key to keeping an attractive looking and structurally sound parking lot. It’s the most cost efficient way to avoid expensive repairs due to pavement failures. Why Use Quality Blacktop Sealer? The sun’s actinic rays harden and dry out the asphalt surface. This accelerates raveling, erosion, and can reduce asphalt thickness by as much as half in just 5 years.